Mr. Painter has established relationships with several local coffee shops to recycle their coffee grounds to support our organic gardening efforts. He incorporates the use of the grounds to create environmentally-friendly compost fertilizer. Mr. Painter demonstrates to the students how to collect the coffee grounds to filter through recycled filters, which he cleans after receiving them from the local coffee shops as well. Next the students collect rainwater from our rain barrel reserves. 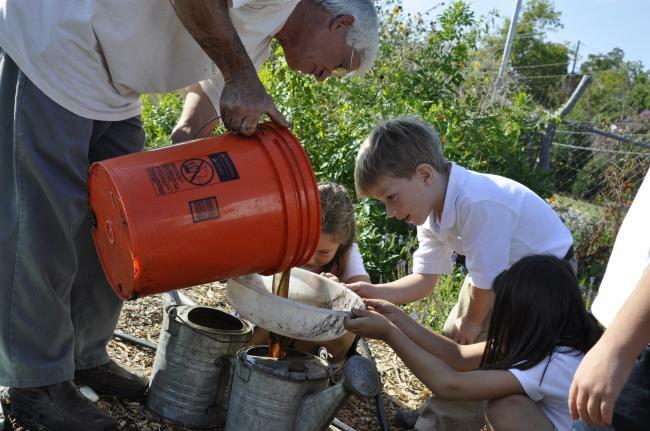 The students pour the rain water through the coffee grounds & coffee filters into buckets which are transported to our current vegetables as a weekly fertilizer. Students record the results in their garden journals. Students have decided that they prefer this method as opposed to purchasing commerical fertilizers because they feel the results are slightly better, but mostly they believe in the power of the 3R's. It is Mr. Painter's desire to teach the students to not only utilize organic alternatives, but to reach out to the community to build relationships for the future.